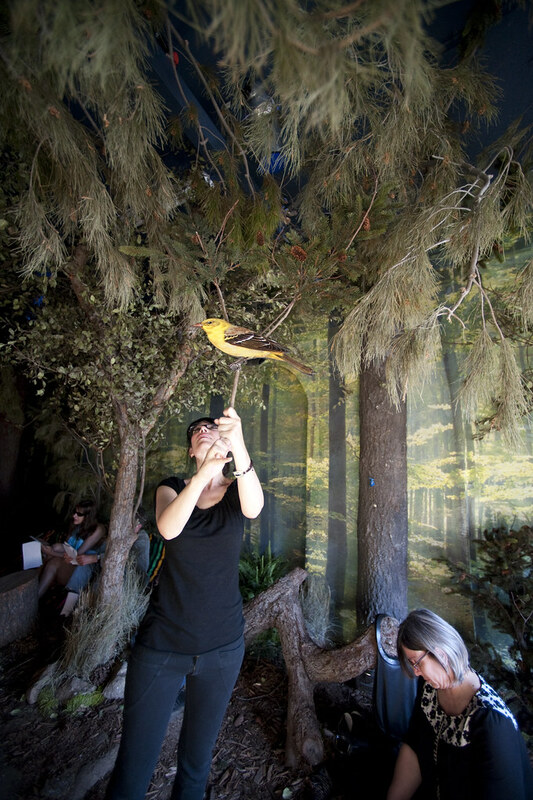 Augmenting reality at The Forest, an installation exhibition at Machine Project here in Echo Park, Los Angeles. I attended the Birdsong Identification Tour. More photos from the Birdsong Identification Tour can be found on my Flickr site, or stream or whatever. Further to augmented reality and its discontents, I wonder if this sort of augmented experience might not suffice in many situations. Human-to-human interaction of some sort, high-fi, low-tech, or material that makes rough use of digital interfaces and technologies without fetishizing the technology and its inevitable hiccups. I suspect many people might not be prepared to count this sort of puppeteering as an augmentation of reality. There are too many “wires exposed”, as the saying goes. The magic disappears because you can see the lovely puppeteers moving the birds around — and the birds are cardboard cutouts attached carefully to bits of branch. There are no screens to oogle, or databases to query and extend with feed mashers, and the like. No intellectual property opportunities here. Just an opportunity to immerse oneself into an media experience where the only computational device is an iPod Touch playing bird calls. Here I and my fellow tourists obtained, in an hour, a quite wonderful introduction to birdsong identification, given by the engaging Jordan Biren. 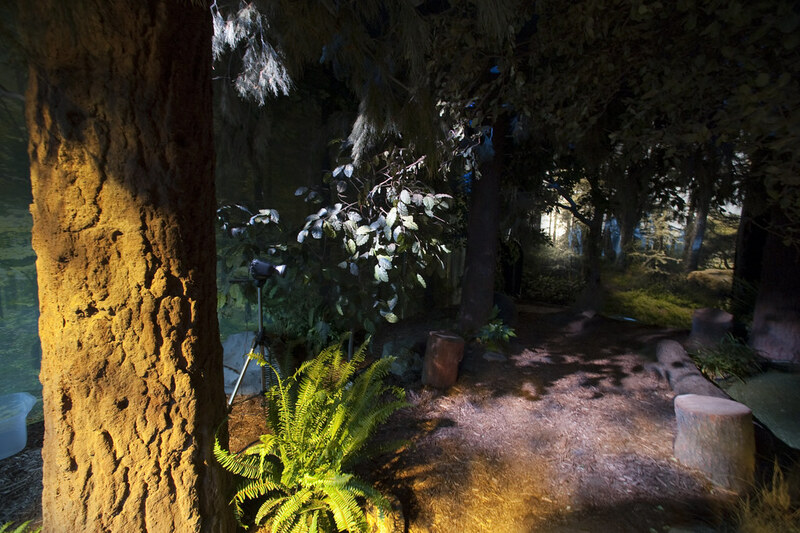 Each of the birds to be identified were flown about the room by puppeteers dressed in stage blacks. The birds were quite obedient and almost tame because, of course, they were representational puppets. This made it quite easy to look at them closely and listen to their songs, which were high quality audio generated by an iPod Touch affixed to their backs. It was a bumper day for bird watching and birdsong listening. I didn’t have to put on goggles and gloves, nor look at a screen or some sort. I could move about and make jokes with our tour guide. I got a little itchy from the chips and shavings and dirt that made up our forest floor. There were some sort of flying insects lazily circling in shafts of sunlight, undoubtedly enjoying the augmentation themselves. There was a soft blast of air conditioning from the AC unit that hung above the entrance to Machine Project, which was welcome, especially given the scorcher LA day that Sunday. Sometimes the birds morphed into other species when the iPod’s would run over into another track — hazards more of touch technology than anything else I suspect what with the bird handlers moving about amongst the trees and foliage. But, this is okay. There’s a larger story told in such instances of bird species evolution and so forth. Failure turned into opportunity. Update: See Will Carter’s visual juxtaposition of the previously referenced WoW project by Aram Bartholl and this new weird, terrifically blundered visual design of a possible augmented reality meant to run on the appropriately named Android platform in precisely the ham-fisted seasick style that will cripple all of our eyeballs. It’s called Wikitude. May it die by cudgel. As the saying goes — we will get the future we deserve. Why do I blog this? A real curiosity of the small (large for this blog) bit of boxing about on my previous post that was a liquor-store-hold-up style criticism of augmented reality. I’m also wondering what techniques make for more or less engaging or legible forms of augmentation. What sorts of arguments from the pro-tech crowd would be leveled on this curated experience? If money is being spent on creating augmented reality sorts of things — and I know it is — would this count as eligible? Here, an art installation that becomes a learning experience augments the world. The gallery is far from any sort of woods, yet the vicinity is augmented to support the transformation into a woodland. Further to another area of augmented realities I am interested in, for the maps-and-places augmentation of reality, what kind of mapping techniques serve to augment a place over and above its reality? If you take those tourist-y commercial maps — the free ones you can often find that highlight commerce zones, tourist sites, Starbuck’s and other things — is that an augmentation of reality? Is the Thomas Guides I have in the back of my car an augmentation — or is it the map of the place? What about the Not For Tourist’s guides I collect of Los Angeles? They parcel the city up into various neighborhoods and explicitly highlight the things that normal, human residents care about — dry cleaners, public libraries, hardware stores, etc. The questions then are — how do we want our reality augmented? To what ends? With which techniques?